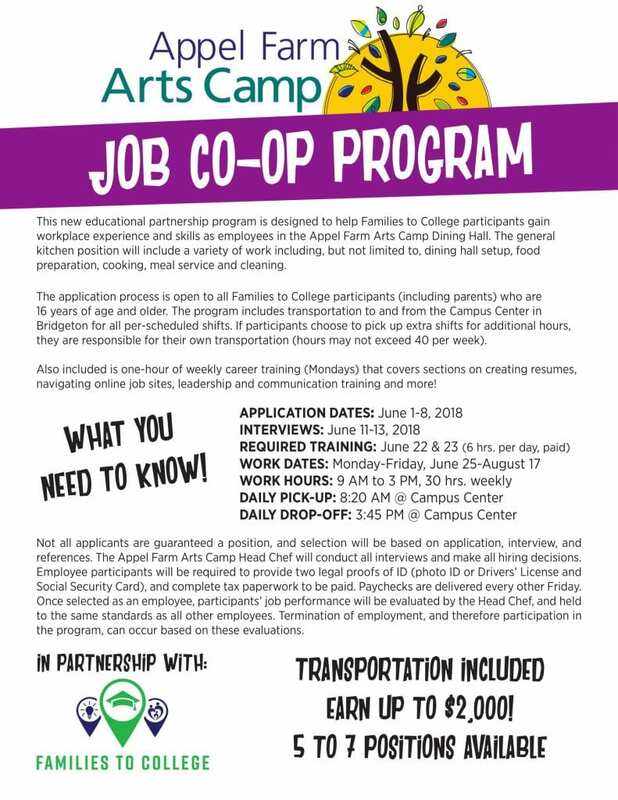 This new educational partnership program is designed to help Families to College participants gain workplace experience and skills as employees in the Appel Farm Arts Camp Dining Hall. The general kitchen position will include a variety of work including, but not limited to, dining hall setup, food preparation, cooking, meal service and cleaning. 16 years of age and older. The program includes transportation to and from the Campus Center in Bridgeton for all per-scheduled shifts. If participants choose to pick up extra shifts for additional hours, they are responsible for their own transportation (hours may not exceed 40 per week). Also included is one-hour of weekly career training (Mondays) that covers sections on creating resumes, navigating online job sites, leadership and communication training and more! Not all applicants are guaranteed a position, and selection will be based on application, interview, and references. The Appel Farm Arts Camp Head Chef will conduct all interviews and make all hiring decisions. Employee participants will be required to provide two legal proofs of ID (photo ID or Drivers’ License and Social Security Card), and complete tax paperwork to be paid. Paychecks are delivered every other Friday. Once selected as an employee, participants’ job performance will be evaluated by the Head Chef, and held to the same standards as all other employees. Termination of employment, and therefore participation in the program, can occur based on these evaluations.